High Noon Casino is an online casino using RealTime Gaming software licensed in Curacao. It is owned by World Online Gaming N.V. The site supports both downloadable software and the ability to place a wager without a download. 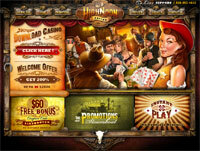 The latest online gambling site from the Club World group is High Noon Casino, released in late 2010. The site carries a Wild West theme, and focuses heavily on visual presentation and strong bonuses. It only takes a quick look at the casino's website to see that a lot of time and attention has been put into creating this site, which is always a good sign. It's easy to get excited about this site, and it's definitely one of the best new casinos in recent years. The casino is powered by RealTime Gaming, allowing High Noon Casino to accept US players. It comes in both download and no-download versions, all using the same great Old West theme as the casino website. Navigation is fun, with animated menus giving quick access to the casino's game library, and an interactive shooting gallery helping players learn more about the bonuses and promotions that the casino offers. The software is extremely well designed, and works fast and smooth despite the heavy graphics. I visited this site for the first time this morning, and I got so wrapped up in the awesome graphics that it was almost half an hour before even got around to installing the software! I was expecting a typical RealTime Gaming casino lobby, but was pleased to find that the software looks the same as the website, complete with fancy menus and all the rest. After throwing some money on my account I dove right in and played a bit of blackjack, then spent some time on a video slot called T-Rex which I had never played before. The game library is very impressive, and they have a lot to offer. By lunchtime my account was lower than it was when I started, but I had a really great time trying things out. The bonus system at High Noon Casino is one of its best features. New players are first treated to an unbelievable $60 no-deposit bonus, then to a choice of either a $200 slot bonus or a $150 blackjack and video poker bonus. Ongoing promotions switch up all the time, but always involve new bonus codes every day of the month, offering deposit matches of $1000 or more every single day. The casino runs a loyalty program too, giving players a chance to get even more extra cash. The site is part of the Club World group, which runs a number of other reputable online casinos including Club World Casino and Manhattan Slots. High Noon is licensed in the Netherlands Antilles. Its software is fully TST certified, and is guaranteed to offer safe and fair play. Full SSL encryption protects personal and financial data sent to and from the casino. Excellent customer service and good banking options add to the mix, making High Noon a very strong and professional casino. While this casino relies heavily on the strong WOW factor connected to its great looks and impressive bonuses, its quality penetrates much deeper than that. In addition to generous bonuses and a unique theme, High Noon Casino offers a very good selection of top quality games, and comes backed by a reputable group with many years of industry experience. With a $60 no-deposit bonus just clicks away, there's no good reason not to sign up today.